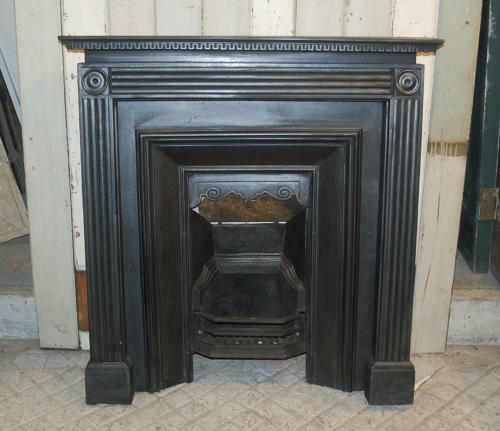 A very stylish and unusual reclaimed satinwood fire surround that has an attractive black painted finish. The surround has a fantastic design, with Greek style fretwork under the mantel and heavy moulded detaling forming a border around the fire surround opening, with linear designs and circular corner pieces. The surround is of a lovely size, suitable for a bedroom or a smaller reception room. PLEASE NOTE the cast insert is not included but will soon be restored and available for sale separately. Please contact us if you are interested in the insert. The surround is reclaimed and therefore has some signs of wear and use. There are some small notches, chips and holes around the fire, especially to the mantel front edge and leg moudings. The mantel has some slight surface cracks and gouges but the fire is solid. There are some light marks and scratches. The fire has a striking and stylish look, suitable for both a period and modern property. A desireable and attractive piece.